It's Tax Day, which means one of two things: 1) you got a $113 refund and are SO RICH RIGHT NOW, or 2) you definitely did not get a $113 refund and are definitely not SO RICH RIGHT NOW. 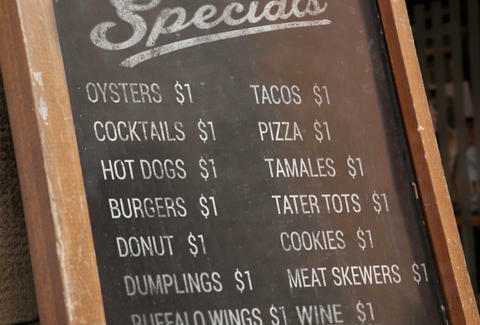 If you're experiencing the latter, this is for you: our first-ever LA Dollar Menu, which rounds up 22 food and drink stuffs you can get in LA for just a buck. 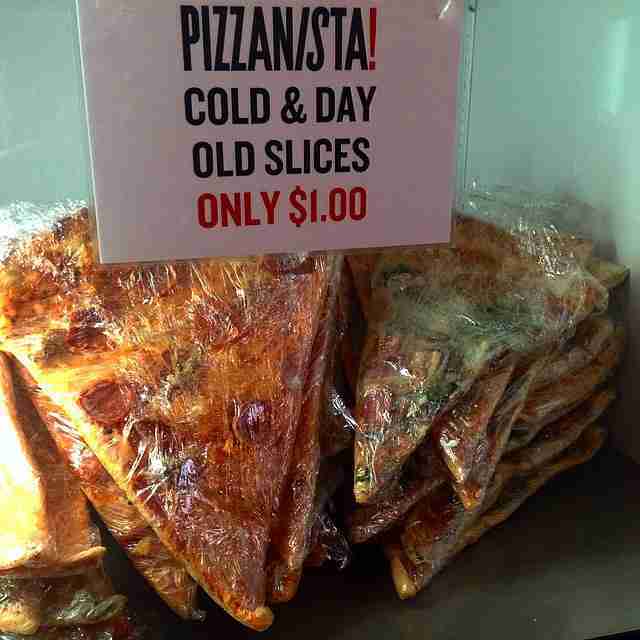 The Deal: This Downtown pizzeria will hook you up with day-old slices straight from the fridge for only a single greenback. 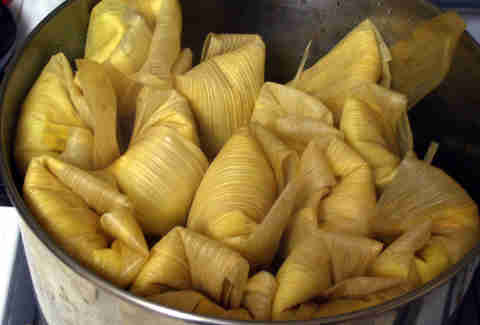 Get ‘em while they’re, uh, cold, and bring them home to heat up. The Deal: Stop by this spruced-up gastropub on Wednesdays for burgers that cost 100 pennies when you buy a drink. The Deal: “Tamales, tamales, tamales!” If you don’t know the dude that frequently hangs out inside this pre-Dodger Game watering hole, get to know him and his delicious $1 tamales. 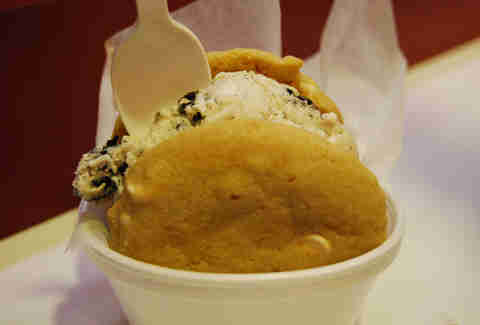 The Deal: Diddy Riese has been doling out made-to-order ice cream sandwiches on freshly baked cookies on the cheap for over four decades with minimal price increases. While you’ll likely have to wait in line with many budget-conscious Bruins, you can still get three cookies for a dollar. If you want the sandwich as seen above, you’ll have to scrounge up... wait for it... 75¢ more. The Deal: More food circus than truck, this favorite spot for Filipino street food offers up a wide selection of skewered meat, including BBQ pork and chicken, as well as plenty of offal, chicken feet, pork blood, and more -- all for a single Washington per skewer. Oh, and the coolest part: you grill it yourself. They set up shop in front of the Temple Mart on Thursdays through Sundays, 6:30pm-11pm, but heads up: the line starts early. The Deal: Buy one regular priced beer, get another for $1 from 4pm-8pm, Mon-Fri and 10:30pm-12:30am, Sun-Thur at this rock-themed Hollywood dive. The Deal: For all of your hard work serving the People’s Republic of, er, California, you deserve a meal fit for the proletariat. 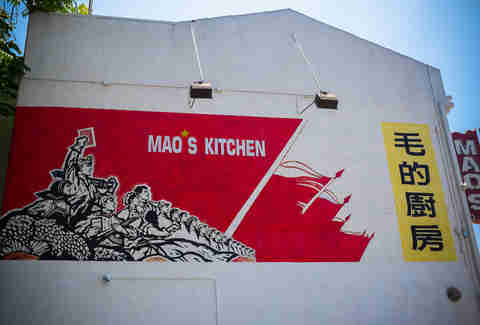 Hit up either of Mao’s locations for a veggie spring roll or a simple salad for only $1 each. The Deal: This second-run theater has $1 all-beef franks and $1.50 movies on Tuesdays and Sundays. Seriously. $1.50 movies. 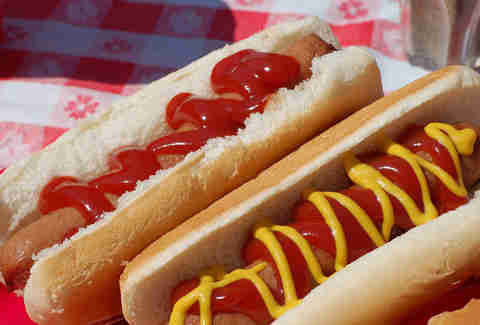 $1 hot dogs. Cheap date night! The Deal: On Monday nights from 5-9pm, head to the Encino location of this purveyor of quality wieners for $1 dogs, which is both a better deal and far less risky than those danger dogs you’ve been scarfing. Choose from the beef or turkey versions of the classic Stand dog with an array of free condiments (go wild with the mustard! ), and complement your dog with a small side of the mac & cheese or chimichurri slaw -- both also just a buck. 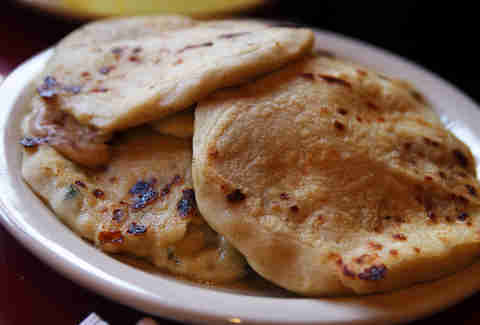 The Deal: A staple of Salvadoran cuisine, these magical, pillow-y circles of corn masa can be stuffed with meats, cheeses, and veggies and topped with pickled cabbage and hot sauce. And while they often come cheap, only on Wednesdays at this hole-in-the-wall on Vermont can you get them for just one smacker. The Deal: Head inside of the Hannam supermarket for this tiny gem of a dumpling stand that dishes up six massive beef or veggie King Dumplings (aka wang mandu, a larger version of the ones from the original Oldboy movie) for only a buck each. The Deal: Belly up to the bar (or a table) and choose from four varieties of $1 oysters with unlimited orders on Wednesdays from 4pm until they run out. The Deal: While you’ll have to shell out more for the famous oyster shooters, on Mondays from 4-11pm this SFV seafood and cocktail spot hits you with bivalves for a buck at the bar, patio, or lounge. 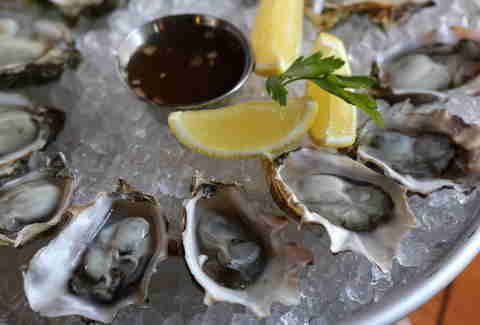 The Deal: Head to the newish location of BPO for oyster hour happening Mon-Fri, 4-6pm when oysters only cost one clam. 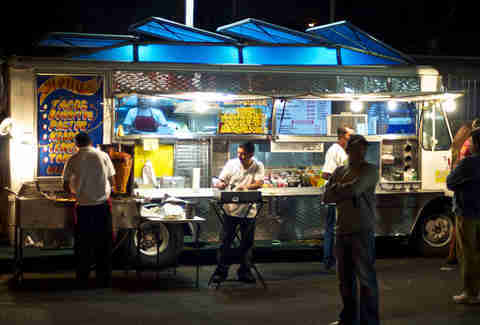 The Deal: Get ready to wait in line for some seriously delicious $1 al pastor tacos, sliced directly from the rotating spit at this always-busy truck. The Deal: You may have had your fill of $1 tacos on Tuesdays elsewhere, but when Wednesday rolls around head to this neighborhood favorite from 6pm-9pm for chicken and al pastor handhelds for a single greenback. The Deal: One dollar for all the tacos. Now you understand the long lines. The Deal: $1 (or less!) 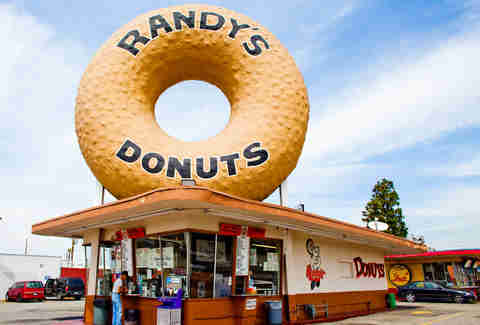 for all of the classic donuts at this towering LA icon. 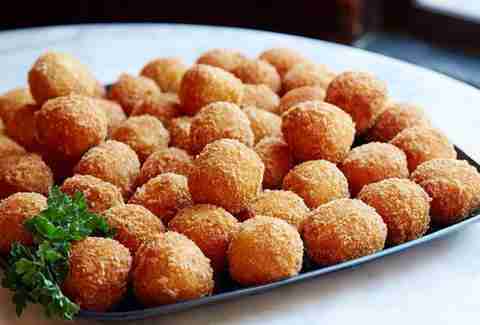 If you want the “fancies,” you’re going to have to shell out another 20 cents. The Deal: This Westwood fave keeps it simple: $1 wings from 10pm-12am nightly. Danny Jensen is a regular Thrillist contributor who hopes that his next studio album, Dollar Hits, goes platinum. He’ll buy that for a dollar on Twitter and Instagram.